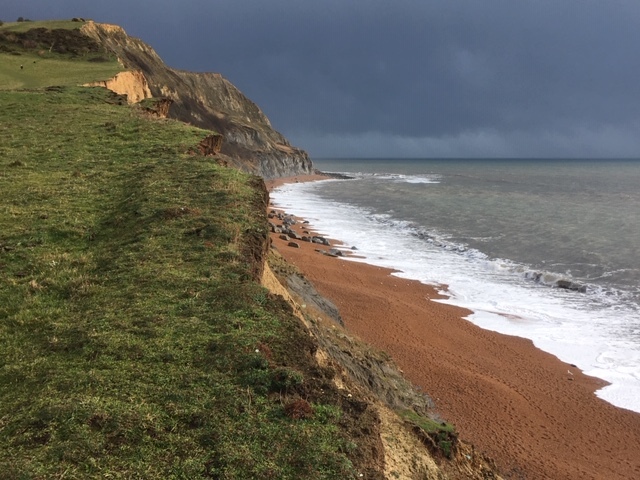 There are more than 80 miles of Dorset coastline, much of it with World Heritage Status. 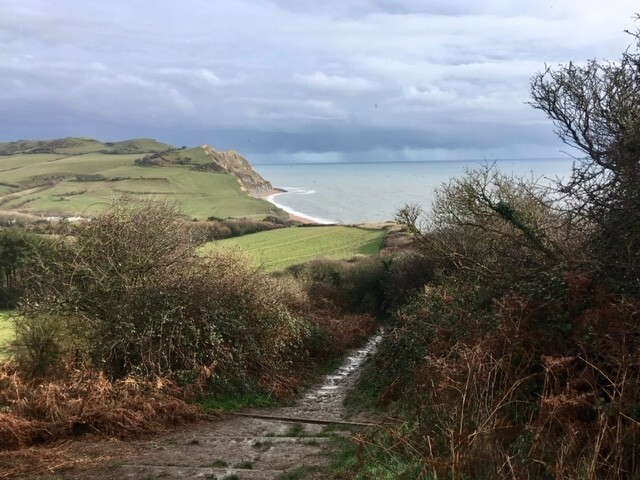 We spent a couple of days exploring the eight mile section between Charmouth and West Bay, an area packed full of fossils, great walks and spectacular views. Our first stop was West Bay, the village made famous by the TV drama, Broadchurch. We visited out of season, early on a grey Monday morning. Although many places were open the village felt a little ‘closed for winter’. We mooched around the harbour, got buffeted by the wind on the pier and then lost ourselves in a huge building full of crafts and antiques. 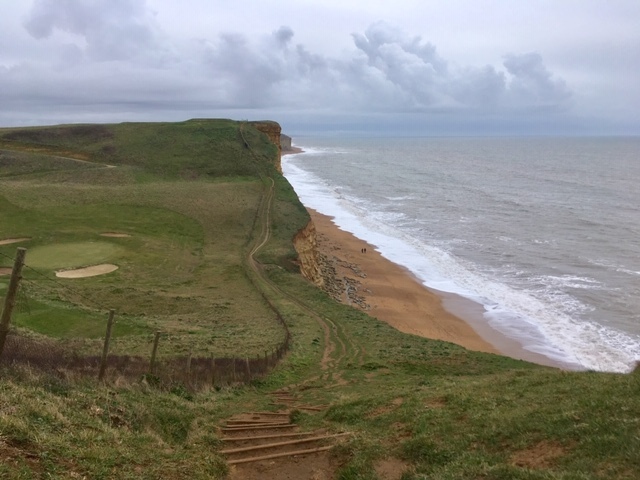 However, it’s the cliffs which West Bay is famous for so, once we’d seen the village, we headed towards the beach and its towering golden sandstone cliffs. Our walk started, as expected,with a steep uphill climb to blow the cobwebs away. Once up top we enjoyed a fabulous walk along a stretch of the rollercoaster Dorset coast. This area isn’t without its dangers. 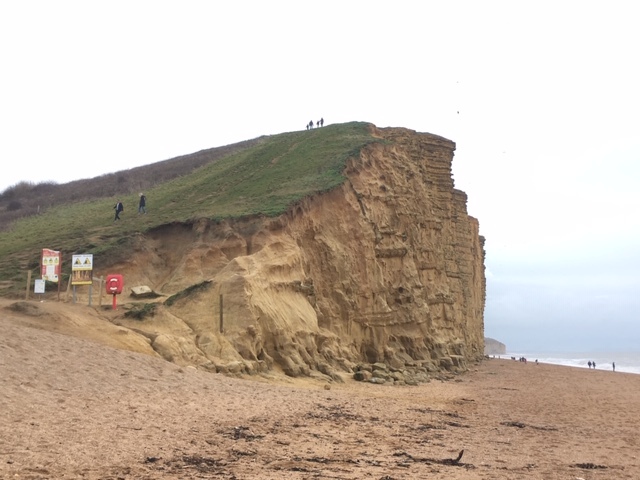 A short while after we visited a huge rockfall temporarily closed both the beach and the cliff path. After seeing the photographs it’s a sobering thought that we were walking beside the collapsed cliff section. Do visit, but abide by all warning notices. We didn’t walk far. 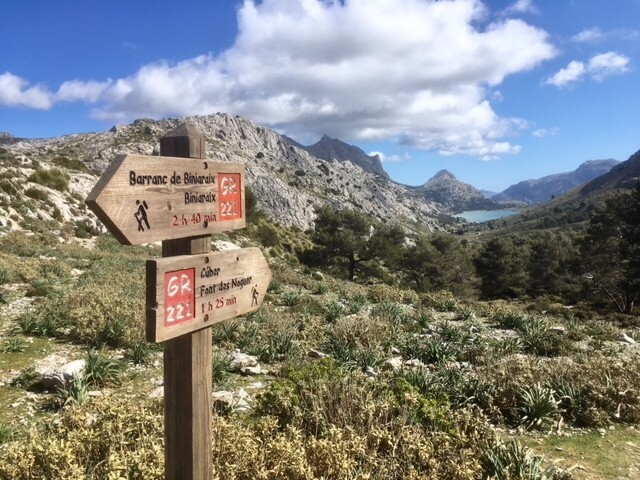 The weather wasn’t conducive to staying on the cliffs and we had a longer walk planned for the afternoon so we soon retraced our steps to the village to find a cafe for lunch. If it’s a nice day, and you fancy seafood for lunch, I’d suggest checking out the kiosks by the harbour. However it was too cold for us to mill around outside and most were still closed for winter so we opted for indoor comfort at West Bay Tea Rooms. This was a great choice with friendly service and good size portions. 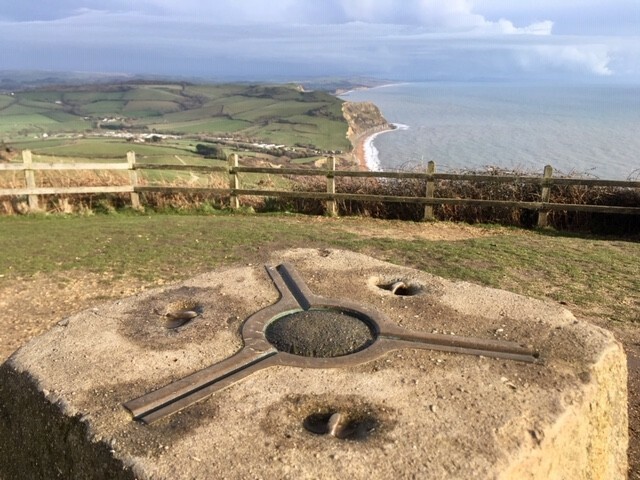 At 191 metres Golden Cap is the highest point on the south coast. We followed the 4 mile AA Golden Cap in Trust route. As per our morning walk it started with a steep schlep up to the summit. The heavy rain had made it much muddier and slippier than I’d envisaged. Although when the sun came out a few minutes later all was forgiven. The route to the top took us around half an hour or so; by then we’d jettisoned our outer layers as spring appeared! On a clear day it is evidently possible to see as far as Dartmoor from the summit. Whenever facts like this are pointed out to me I’m always disappointed as I can never see as far as some people obviously can. I could certainly see Portland Bill and, in the opposite direction, Lyme Regis. But not Dartmoor. 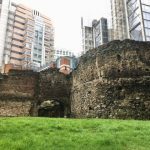 Our route continued down the far side, passing the ruins of St Gabriel’s Church. 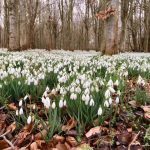 There are some fabulously located National Trust holiday cottages here if you fancy getting away from it all (or as much as you can in Dorset). These buildings are all that remain of Stanton St Gabriel, a village deserted in the 18th Century after residents moved to nearby towns for work. The rest of the route took us on a tour of green and quiet lanes. 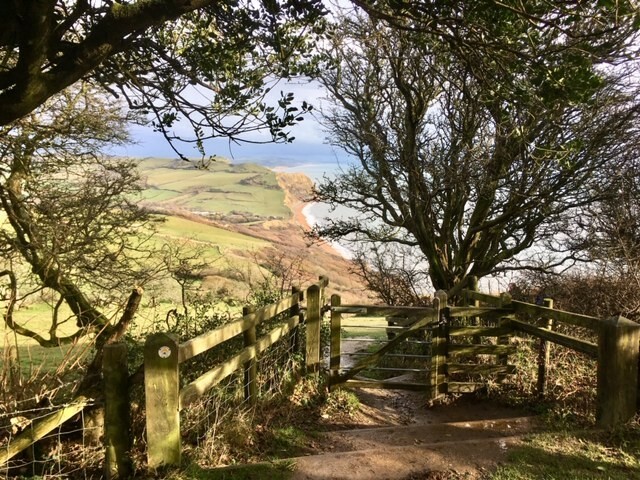 We cut back beneath Langdon Hill, which is still part of the National Trust estate and offers an alternative starting point for the Golden Cap ascent. As you return to Seatown the views of the Dorset coast return too, it’s even more beautiful when the sun is shining! 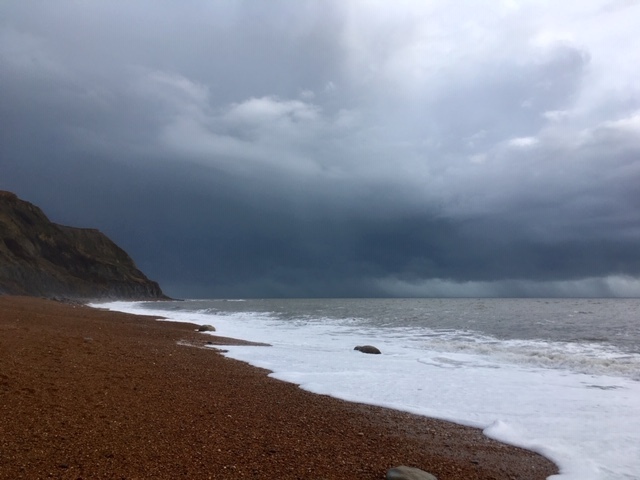 The following day saw us in Charmouth, exploring a stretch of Dorset coastline marketed as the Jurassic Coast. The cliffs and beaches are full of fossils that reveal the Earth’s history, from prehistoric Triassic deserts to tropical Jurassic sea. 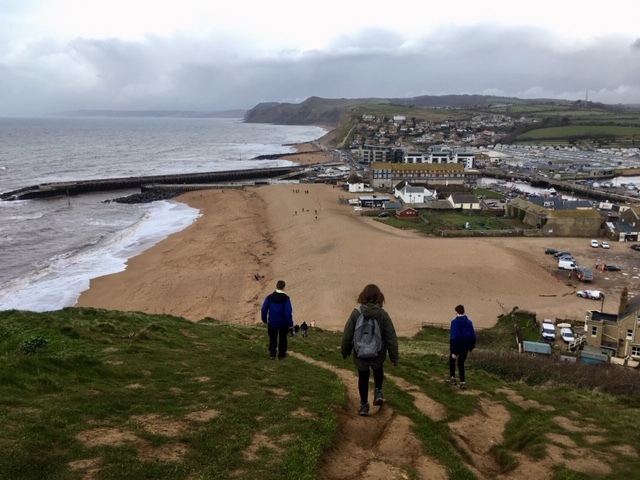 Fossil hunting in Charmouth has long featured on my UK bucket list so I was looking forward to our next activity, a walk with a fossil expert. 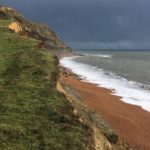 We’d booked a walk with fossilwalks.com; at just £5 per head it was excellent value. 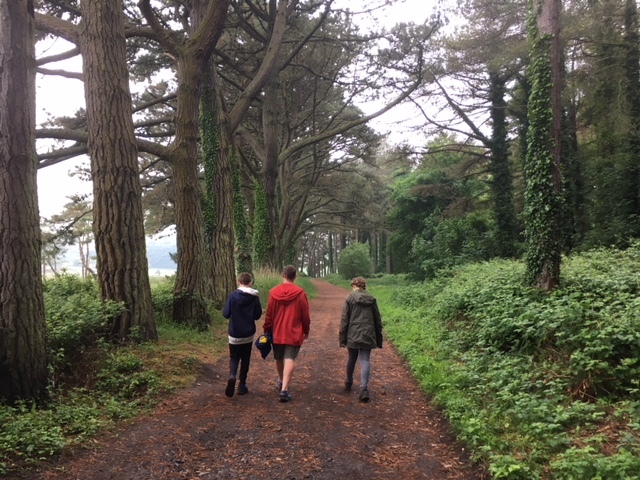 They run most days during the school holidays or alternatively you can book a rather more expensive private walk. Whatever you choose, book early. The walk starts with a half hour introductory talk about where to find the fossils, what to look out for and what you might find. Chris, our guide, passed around samples of the different fossils for us to handle. We also learnt how to use our hammers correctly (additional cost, book in advance through the guide). After our briefing we set off to find fossils on the beach. This is a key safety point. 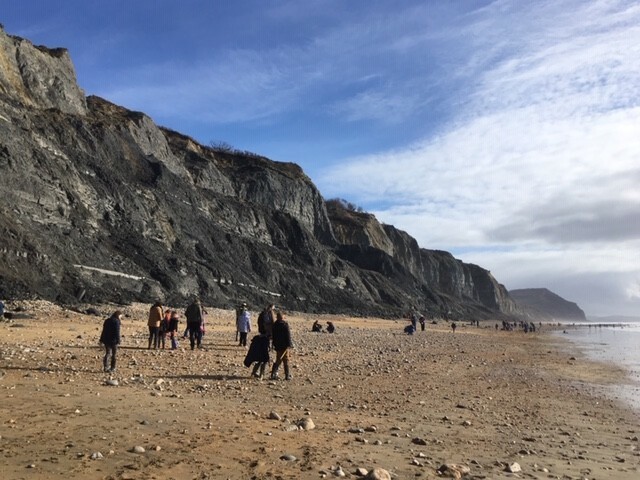 Fossil hunting takes place on the beach, not the cliffs! I was sceptical at first to think that fossils would just be lying around on the beach. That was until I found my first ammonite on the sandy shore. Followed by further ammonites, belemnites and, what I’ll call, stones with fossils in. Perhaps not exciting finds in geological terms but I was happy with my haul. After the walk we visited Charmouth Heritage Centre which houses some larger fossil finds information about the area’s history and geology. Entrance is free (although do leave a donation) and highly recommended; they also offer guided walks and hammer hire. If you haven’t managed to find any fossils on the beach there’s also a fossil shop next door. Shush, no-one need ever know you’ve bought one. So, there you have it. Two days exploring the Dorset coast. I now need a few more months to explore the rest of it! 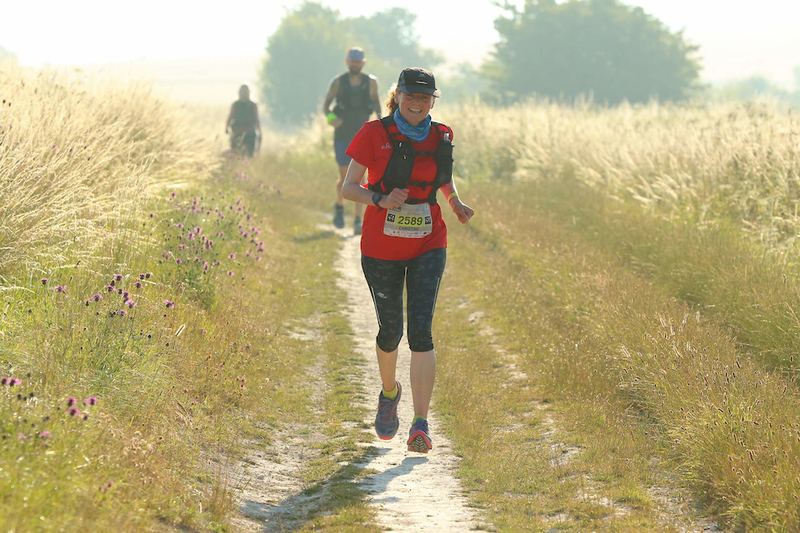 This wasn’t particularly enjoyable but running 100km along the Ridgeway from Lewknor to Avebury was a huge achievement. And one I’ll never repeat! Given that I swore I’d never run another marathon I’m not entirely sure why I decided to run an ultra instead. I guess I like a challenge. It was hot, it was very long and my toenails have only just grown back. But I did it! It’s a strange turn of events when I count a day sitting in a car driving the Hardknott and Wrynose passes as one of my favourite activities of the year. 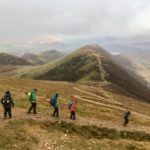 Despite our incredible summer we managed to coincide our Lake District holiday with a week of rain. All of our wet weather clothing was, er wet, so I decided on a driving tour, taking in the famously steep passes. Fortunately the drive wasn’t quite as hairy as I expected. Instead, the passengers were treated to great scenery (I could only watch the road), waterfall walks and a spectacularly located Roman fort. I loved everything about our day exploring the tidal Worm’s Head. How can I fail to enjoy a day with all of my favourite things in? Rockpooling, scrambling over jagged rocks, watching seals and eating sandwiches with an incredible view for a backdrop. A fabulous day. This is is the year I finally made it to Majorca. And it was everything I expected. From the moment we left a grey, cold UK at Easter and flew into the warmth of sunny Palma I knew I’d love the island. Things that I remember? 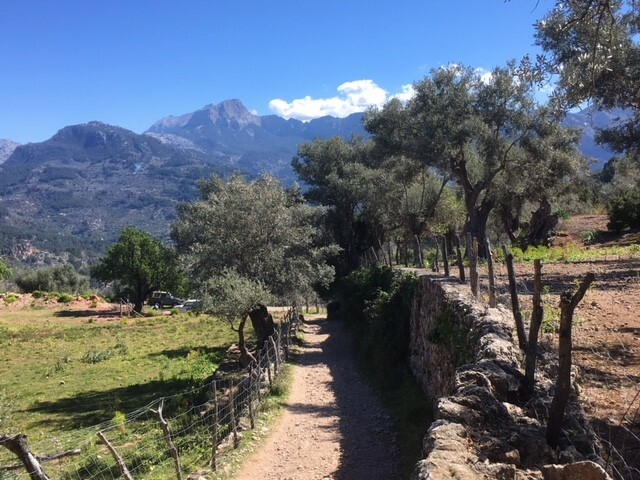 The smell of the citrus groves, incredible mountain walks, a Tardis of an apartment (with its own lemon grove) and freshly squeezed orange juice. It was one of those holidays where every aspect was perfect. Even the teens loved it! I’m not much of a festival person but when it’s local (as in, I can sleep in my own bed) and features my kind of line up (read, suitable for middle aged person) then I make an exception. I didn’t actually buy a ticket but volunteered for a few hours and got to watch George singing one of my favourite songs on one of those hot sunny weekends. Pretty memorable. Regular readers will notice two things – I don’t blog as often as I used to and the kids don’t feature as much. They’re both teenagers now; one is in their GCSE year, the other is Xbox obsessed. We still go out and I’ll continue to write about our walks, holidays and day trips. But I’ll be focusing less on family attractions and more on ‘grown up’ activities, sometimes without the kids. What will I blog about? 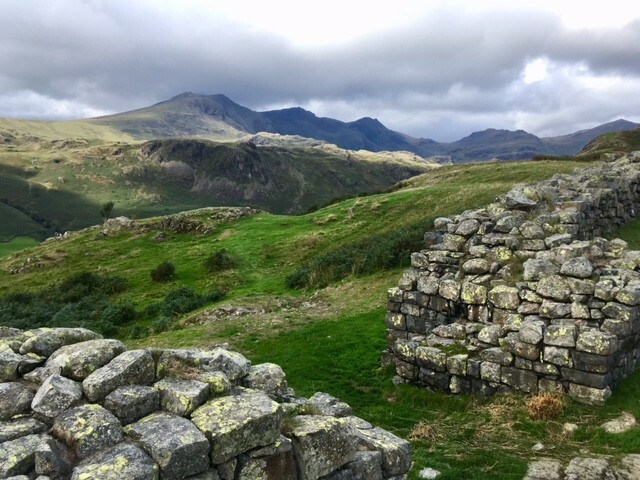 Well, I’m still working through my UK bucket list so I’ll be posting about these trips; in fact I have a couple to still write about from recent months. And, in a little over 12 months, I have a big birthday coming up and am planning a year of mini adventures so I’ve plenty of ideas up my sleeve. How about you? What are your plans for 2019? Think of the Gower peninsula and you probably imagine holidaymakers enjoying its golden sandy beaches. But whilst the area is home to some of the most celebrated beaches in Wales, spare a thought for its quiet northern neighbour. 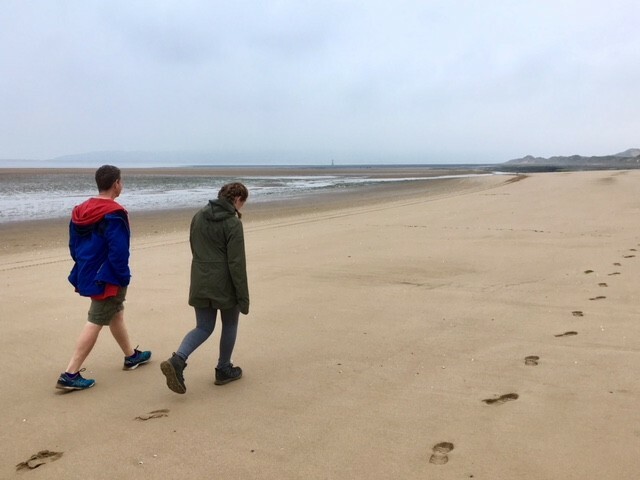 On a recent trip we left the busier southern beaches behind and spent a day discovering just how different the northern Gower is. 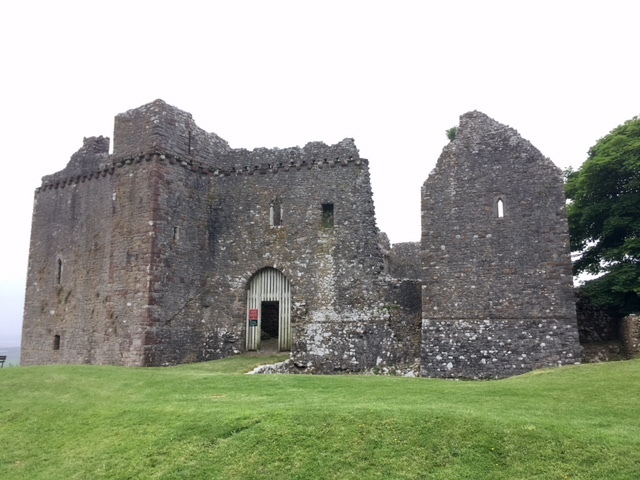 We started with a visit to Weobley Castle, or more accurately, the remains of a 14th Century fortified manor house. It’s a low key attraction with most of the inside area open to the elements. One room has been restored and this houses panels detailing the history of the area and the de la Bere family who lived here. But it’s the positioning of Weobley Castle that’s most impressive. 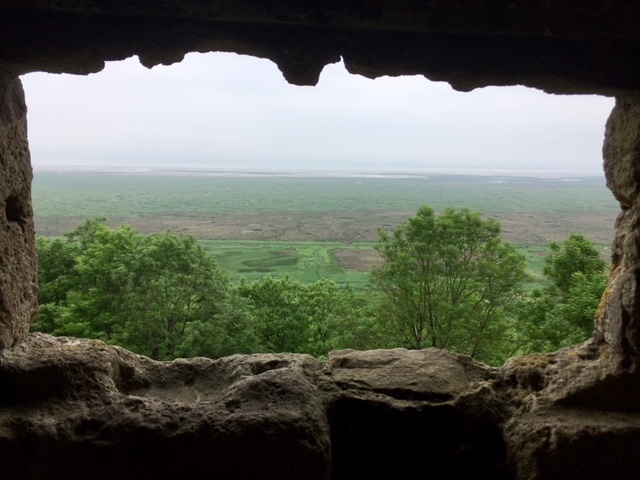 Standing high above the coastline a window provides a perfectly framed view of the salt marshes and mud flats that typify the north Gower coastline. Admittedly not to everyone’s taste but it’s my kind of place. The salt marsh is grazed by ponies and sheep whose diet of samphire, sorrel and sea lavender contribute to its unique flavour. If you fancy trying the resulting salt marsh lamb you can often buy it from the farmhouse where you pay your castle entrance fee. 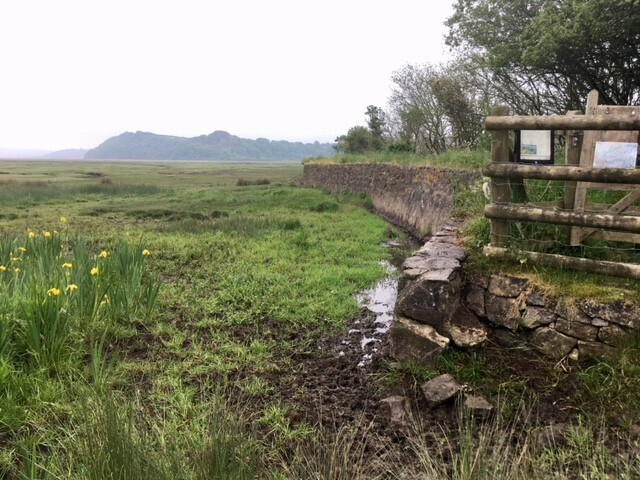 Llanrhidian marsh is a great bird watching spot, particularly during the winter months when it’s home to a large population of waders and wildfowl. We asked permission at the farmhouse and walked down to see what bird life we could spot. Despite a lack of binoculars we saw a couple of little egrets wading in one of the muddy channels and a fledgling nuthatch hopping along the ground. However we didn’t walk far as the ponies were having fun cantering around the marsh and we decided it best to watch them from afar. It’s a ten minute drive from Weobley Castle to the small village of Llandmadoc. 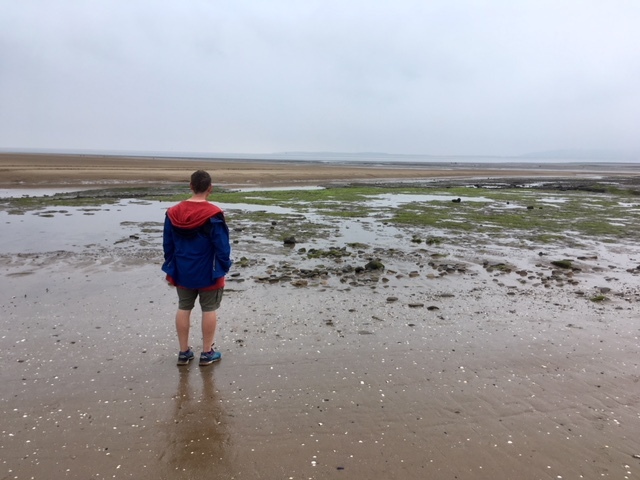 After a refreshment break in the community shop and a spot of hanging around in the car waiting for the rain to clear we headed out towards Whiteford Sands. 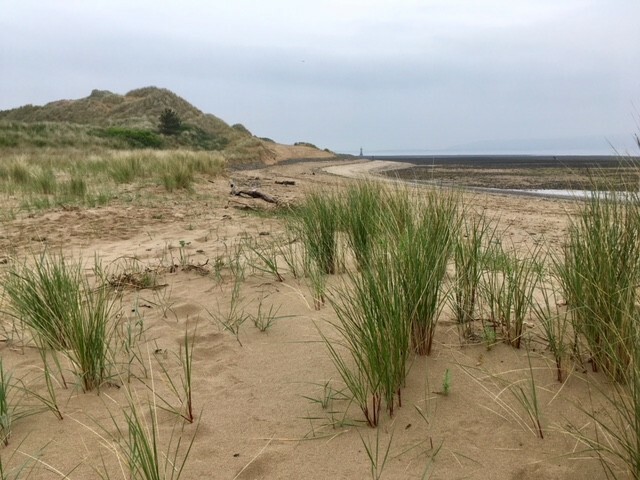 This is the most northerly beach on the Gower peninsula and, thanks to the lack of a car park, one of the least visited. After a 20 minute walk we reached the beach and were greeted with a sign warning visitors not to pick up unusual items. 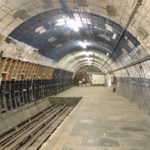 The area was used as a firing range in World War II and unexploded shells still turn up occasionally. Whiteford beach stretches for about two miles, and is backed by sand dunes and trees. We visited at low tide and the waters were too far out for a paddle. Instead we walked along the tideline checking what treasures high tide had bought. We found several sea potatoes, whelk egg cases and lots of crab legs. There were a couple of small jellyfish, but nothing like the huge barrel jellyfish we’d seen on the southern beaches. As we walked we heard our first, and only, cuckoo of the year. It was somewhere in the trees but despite it reminding us of its presence every few minutes we couldn’t spot it. Given the earlier rain it wasn’t surprising we were the only ones on the beach. This was also fortunate as I subsequently discovered that Whiteford Sands is a well known naturist beach. I can only imagine how embarrassed the teens would have been if we’d come across some au naturel visitors. Later a couple of quad bikes passed us and we realised the beach wasn’t entirely empty. Far out we could see a couple of groups of people who I guess were harvesting cockles or mussels. A backbreaking job perhaps better left to the oystercatchers! At the far end of Whiteford beach there’s a cast iron lighthouse which was built in 1865. Over 30 shipwrecks have been recorded in this area, including 16 ships sailing out of Llanelli which were wrecked in just one night. 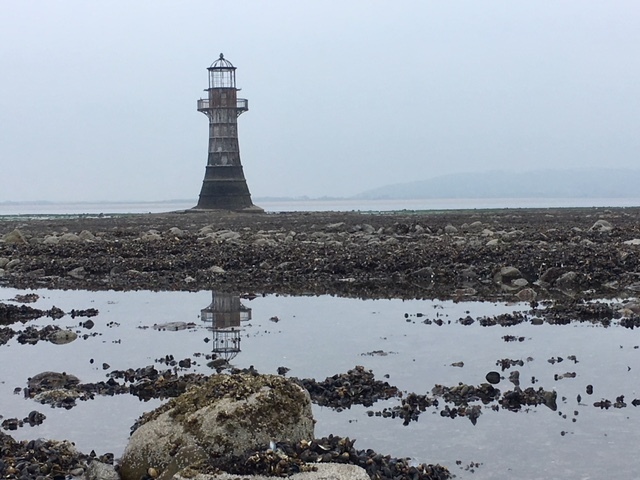 The lighthouse is accessible on foot at low tide, providing the ultimate goal for my beach walk. Although I underestimated just how far out it was. The rest of the family sensibly decided to sit it out on the beach whilst I seemingly walked several miles out to it (OK, perhaps half a mile). 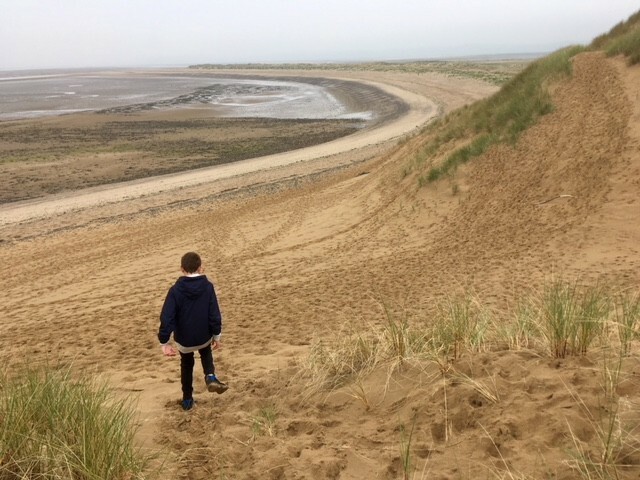 Leaving the lighthouse behind we walked past the sand dunes that make up Whiteford Burrows. The path gradually turned from sand to mud as we moved inland. Yellow irises flanked our route, indicative of the marsh that lay just off our route. We arrived at a path junction and I was immediately drawn to the sea wall that heads out across the marsh. The wall was breached in 2014, resulting in sea water flowing into the freshwater marsh. Rather than repair it the National Trust have left nature to take its own course. This has resulted in the area previously behind the sea wall turning into salt marsh. Good news for wildlife although not so good if you wanted to take the footpath along the sea wall! A little later we stopped in a bird hide overlooking the marsh. Our lack of binoculars once again put paid to any serious bird spotting so we didn’t linger. There was also the small matter of reaching Cwm Ivy cafe before closing time. Sitting in the cafe a short time later we reflected on our northern Gower day out. The area has a stunning coastline, nature reserves and historical attractions. Yet we‘d seen less than 30 other visitors all day; it’s definitely the place to visit if you’re looking for a quiet day out (particularly in the rain)! 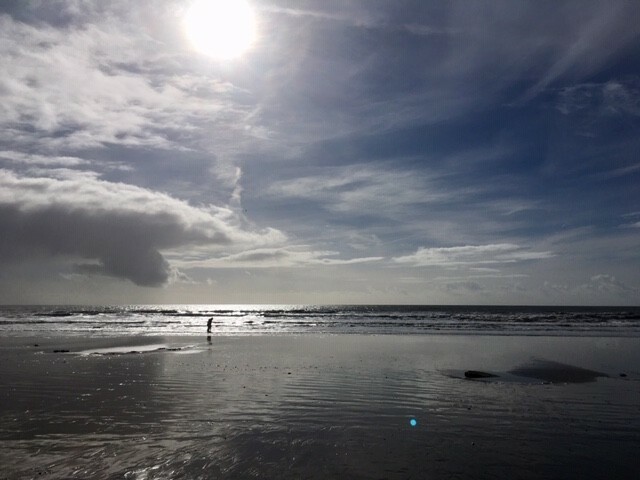 Exploring the Gower Peninsula was one of my UK bucket list challenges. 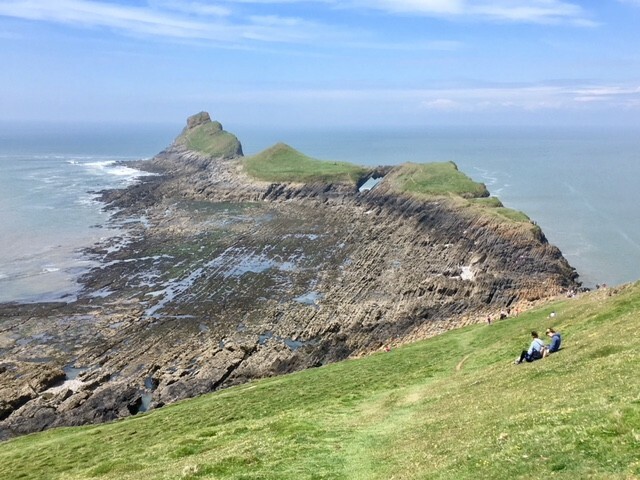 As well as the above day out you might also like to read about the fun we had tackling the Worm’s Head at Rhossili. Weobley Castle is open daily between 1 April and 31 October. It’s free for Cadw members, alternatively pay in the farmhouse before entering. 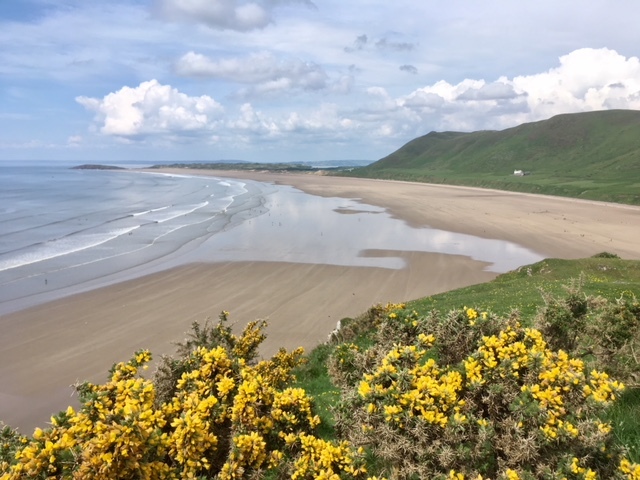 The three miles of golden sand at Rhossili on the Gower Peninsula regularly features in top ten lists of best beaches. This year alone it has been voted the number one beach in Wales, third best in the UK and 25th in Europe. I can see why. But, and I will whisper this, perfect sandy beaches just don’t do it for me. I don’t swim, sunbathe or surf. I need something else to hold my attention. So it’s fortunate that, at the southern end of the beach, there’s a fabulous tidal island that’s right up my street. 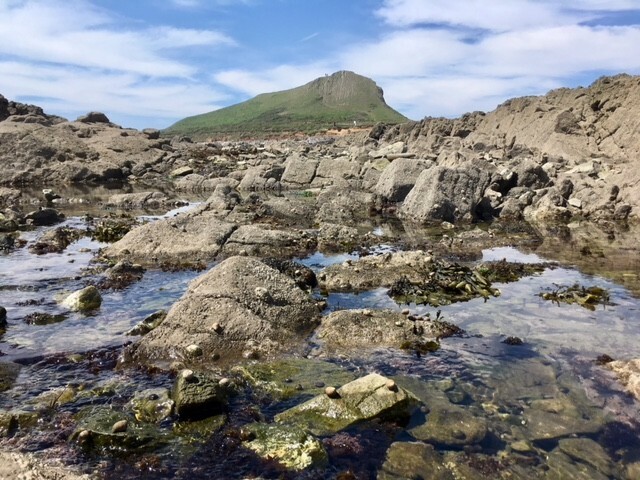 Let me introduce the rockpools, cliffs and wildlife of Worm’s Head. But, first, a word about the name. The Vikings named the promontory ‘wurm’ which translates to dragon. Not worm. I guess that with a little imagination the green summits do resemble a serpent’s back. 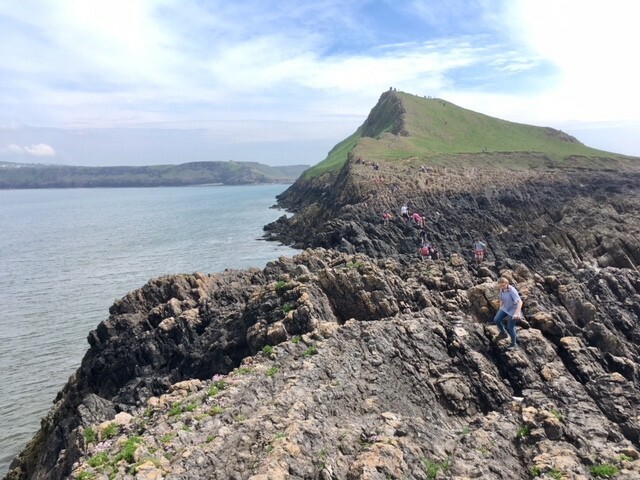 The large National Trust car park for Rhossili beach is about 20 minutes walk from Worm’s Head causeway. From the car park it’s a surfaced track almost as far as the volunteer run coastwatch station. From the headland there’s a short scrambly section to get down onto the causeway which links to the island. 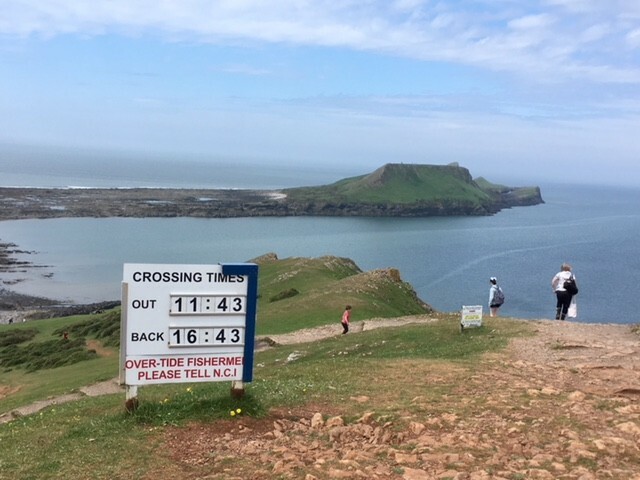 Worm’s Head is accessible for 2.5 hours before and after low tide; there’s a large notice advising the safe crossing times so there’s no excuse for strandings. If you’re tempted to race the tide the small coastwatch station has a tally notice in the window advising of the number of rescues. Don’t add to the numbers! Crossing the causeway takes about 20 minutes assuming you’re not distracted by the rock pools. We delayed our rock pooling until the return journey so soon reached Inner Head, the first section of Worm’s Head. The entire island is about a mile long; Inner Head is joined to Outer Head, by Low Neck. I guess the Vikings had exhausted their imagination after naming the island. We hadn’t been organised enough to make a picnic but fortunately we’d bought some sandwiches in Rhossili. The sandwiches were surprisingly good although I think a combination of sea air, fabulous views and rumbling tummies contributed to our enjoyment. We ate our sandwiches, enjoying the view, and discovered that the people staying next to us in the campsite were sitting only a few steps away. Great minds. After lunch we faced the first climb of the day to the summit of Inner Head. Although quite a steep hill it was relatively short and once over the top we were treated to a panoramic view of the serpent in all its glory. As we dropped down to Low Neck we took a slight detour to peer over the cliffs at the grey seals below. A couple were swimming lazily in the sea, another huge one was laying on the rocks, seemingly oblivious to the humans above them taking photographs. The most exciting part of the route came next, clambering across the jagged teeth of Low Neck. OK they were only rocks. But surprisingly fierce ones; I still have one of the bruises! There are a few hand on rock moments and god forbid if you’re trying to cross in Crocs (as I saw one lady wearing). The big positive is, in dry conditions at least, the rocks are very grippy. This section can take some time to negotiate so do bear this in mind if the tide is turning. My geology knowledge is basic but even I could appreciate the different strata and faults in the rocks. However my eyes glaze over at the mention of wave cut platforms, carboniferous limestone and calcite veins; suffice to say they all feature on Worm’s Head. 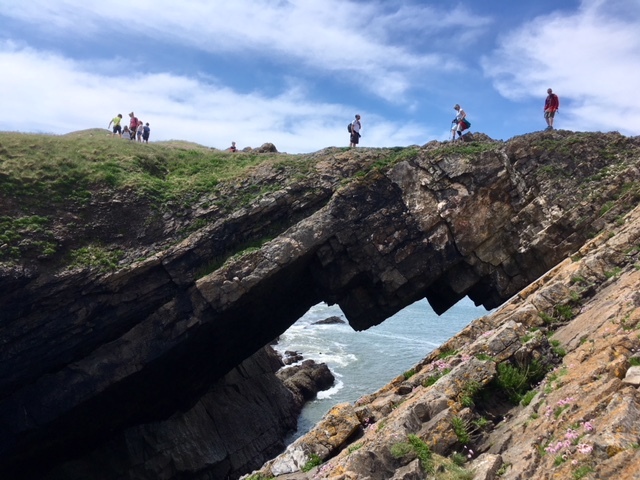 Devil’s Bridge is the remains of a collapsed sea cave. One day it too will fall into the sea. Until then it’s one of the most photographed features on the island. The best photographs are obtained by scrambling down towards the sea, probably not for the faint hearted. The crossing itself is straightforward and nowhere near as airy as I expected, but then again I didn’t attempt to look down. I might have changed my mind if I took a moment to peer over the edge. A little further on we came across a cave window, perfectly framed for a photograph out to sea. If you’ve come this far with children be warned there’s a sheer drop off the cliff on the other side of the window! At the bottom of Outer Head there’s a notice advising of nesting birds and asking visitors to keep to the marked path. We didn’t go any further as we’d left the teens at Devil’s Bridge and I had visions of them scaling cliffs or (more likely) arguing. Instead we stopped and watched the seabirds for a while. Guillemots and razorbills whirling and diving around the cliffs. I looked in vain for puffins but to no avail. 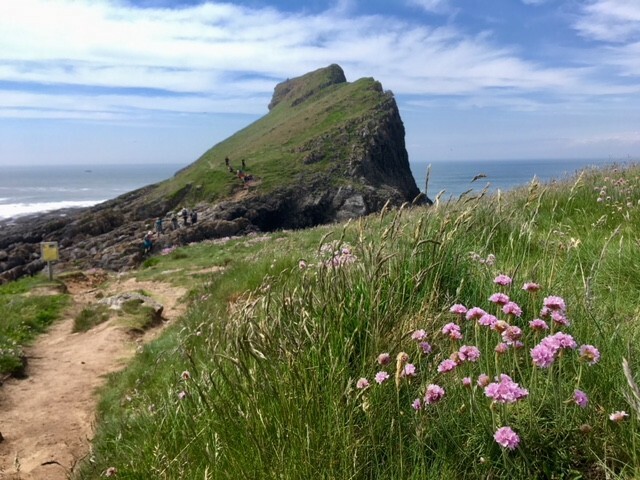 We took an alternative return route, keeping low and circling around the hill, enjoying the waves of pink sea thrift that lined the path edge. Back at Devil’s Bridge the kids were still on speaking terms and had been taking photographs of each other messing around on the bridge. I’m glad I wasn’t around to watch them do this. My parenting survival gene may have kicked in! 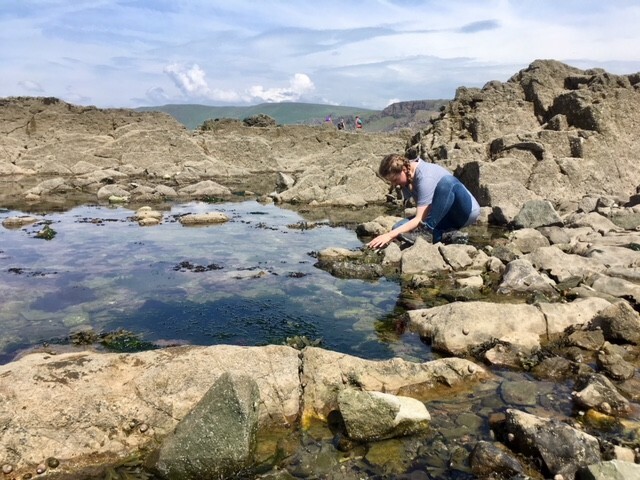 The second highlight of the day, after Low Neck, was rock pooling on our return journey. I love rock pools. The ones on the Worm’s Head causeway were fascinating; I could easily have spent all of low tide mooching around them. They were teeming with creatures; anemones, hermit crabs, shrimps, dog whelks and seaweeds to name but a few. Some of the rocks were completely covered in mussels and barnacles making it impossible to avoid standing on them. And sometimes the weird and wonderful shapes of the rocks alone were enough to make me stand and stare. Despite the tide being out I still managed to get wet feet. I can only blame the sun reflecting off the water for my decision to walk through a large pool. My trainers and socks got soaked through so it didn’t matter when I did it again a few minutes later. Fortunately it was a warm day and I managed to forget how wet my feet were before the family stopped laughing at me. The final part of our journey took us back to Rhossili for a well deserved ice cream. And several water bottle refills at the NT shop. The day had turned out much warmer than we’d planned for! 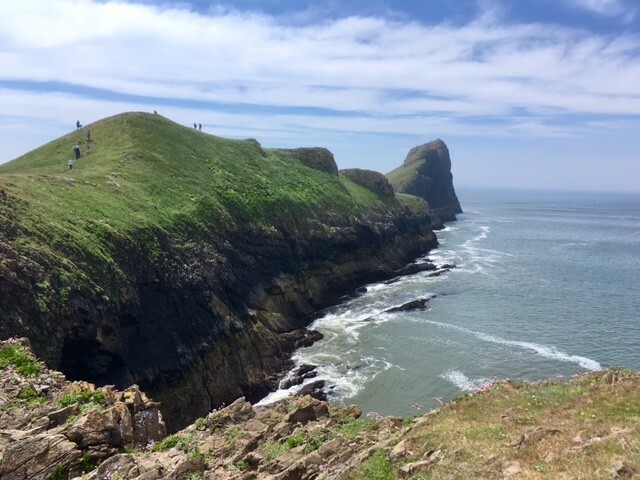 The National Trust owns the land around Rhossili and Worm’s Head. Car parking is free to NT members or £5 for the day for non-members. There are no facilities on Worm’s Head.